This summer season many professional golfers from around the country are heading to Branson to play golf at Thousand Hills Golf Resort. The 18-hole golf course at Thousand Hills is the most popular golf course in Branson that was voted 4-Stars by Golf Digest magazine in 2009. It was also voted as the Best of the Ozarks for two consecutive years by Springfield News-Leader. Branson golf gained wide popularity because of its ability to cater different levels of golf skill. This popular Branson golf course at Thousand Hills has three separate sets of tees that cater all golfers without discrimination on age and experience. The great ambiance of the golf course is one of the reasons why many professional golfers choose to play golf at Thousand Hills. Your wonderful golf vacation in Branson gives you the opportunity to view spectacular scenery of the wooded valleys, forests, and Ozark streams that you would never think that you are near the heart of Branson. This beautiful golf course in Branson is only five minutes drive from Lake Taneycomo and ten minutes from Table Rock Lake where viewing picturesque scenery is a fascinating experience. Your golf experience at Thousand Hills Golf Resort will not be complete without renting top of the line golf equipments at affordable prices. The golf staff will be happy to show you rental prices for Nike golf clubs, and everything in the golf club rentals. Whether you planned to play golf during your wonderful stay at golf resort or just want to enjoy exciting activities the resort can offer, the staff in the resort is always ready to assist you. 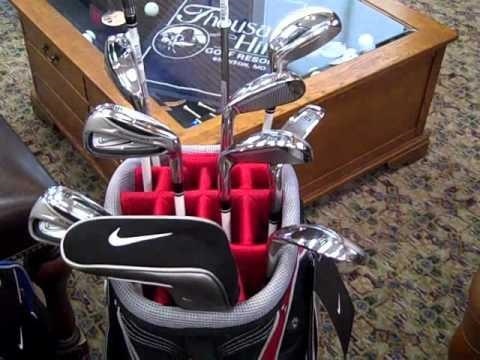 The advantage of playing golf at Thousand Hills is that you have the opportunity to rent sets of premium Nike golf clubs. Club rental prices for 9 holes start from 15 dollars and 25 dollars for 18 holes. If you are staying at the golf resort with the whole family, you might consider playing with the Greatest Adventures Minigolf. This newest, wildest, and largest minigolf course in Branson is a kid-friendly golf course that was built in 2008. Every member of the family will be delighted to challenge for fun with its unique design of 36 hole golf course. This memorable adventure with the minigolf course features the Egyptian artifacts, waterfall cave, the jungle animals, and the smoking dragon. Many famous professional golfers from around the world come to Branson to compete with the spectacular golf courses in the Greatest Adventure Minigolf. The beautiful location of this minigolf competition is situated on Gretna Road at Branson Meadows in Branson where movie theaters are located. If you are not participating the action, you can visit the gift shop or the snack bar near the huge waterfall. You can also watch at your own pace TV program shows or movies in a flat screen TV inside the building. So, if you want to start hitting those golf balls, bring the whole family this summer season in Branson and stay at Thousand Hills Golf Resort.